Nicky ,how did you get into craftivism? 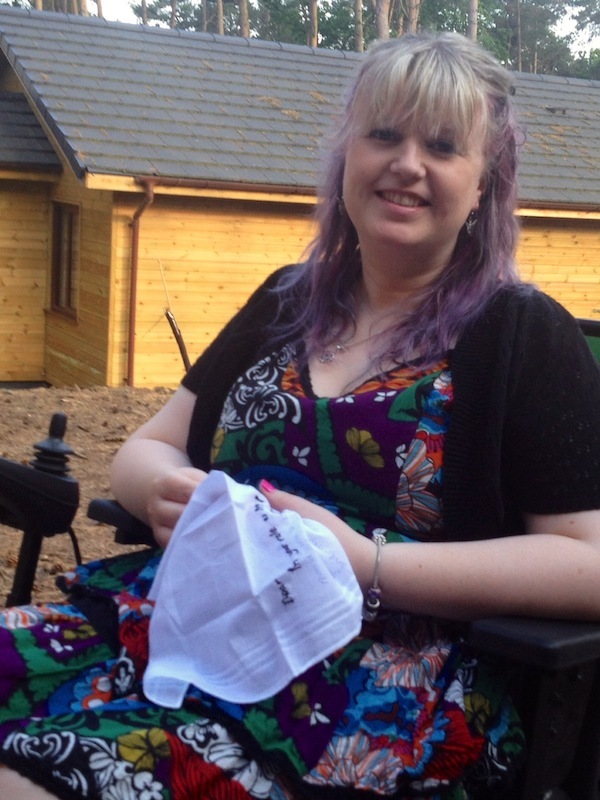 I recently attended an event organised by the MS Society and took part in a craftivists session run by Sarah Corbett. I hadn’t heard of craftivism before, but I’m kind of crafty and occasionally a little bit radical, so I popped along to see what it was all about. The first session wasn’t about ‘craft’ as such, but about why Sarah uses crafting as a tool for her work as an activist. My first thoughts were all about how many crafters I knew and how quickly I could spread the message among them. I felt compelled to try and get everyone to become a craftivist, but I didn’t feel like this for long. Sarah explained the deeper meaning behind craftivism and this challenged me to think about the purpose of crafting to send out a message. The message is always more important than the craft. In the second session we got our hands on needle and thread. I enjoyed this because I love craft, but having thought more about why I was taking part, it was also satisfying on a deeper level because I had an objective, a purpose. In my business as a textile artist I create a piece of craft for aesthetic reasons only. Does it look pretty? Yes, job done. Craftivism is so much more. 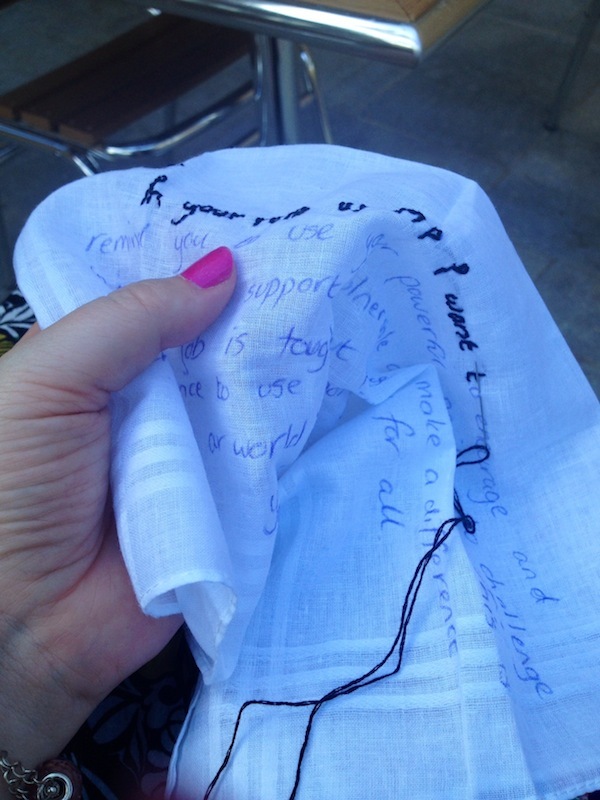 Tell us about your craftivism project / event – what did you do, and how, and why? I took my hanky in the kit provided by Sarah and scripted a message to my local MP asking him to step up to the mark and start treating disabled and vulnerable people more fairly. The recent campaign by the MS Society #treatmeright highlights how access to MS treatment is varied throughout the country with some people not receiving any form of treatment for their condition while others have access to all kinds of medication and even complimentary therapies. 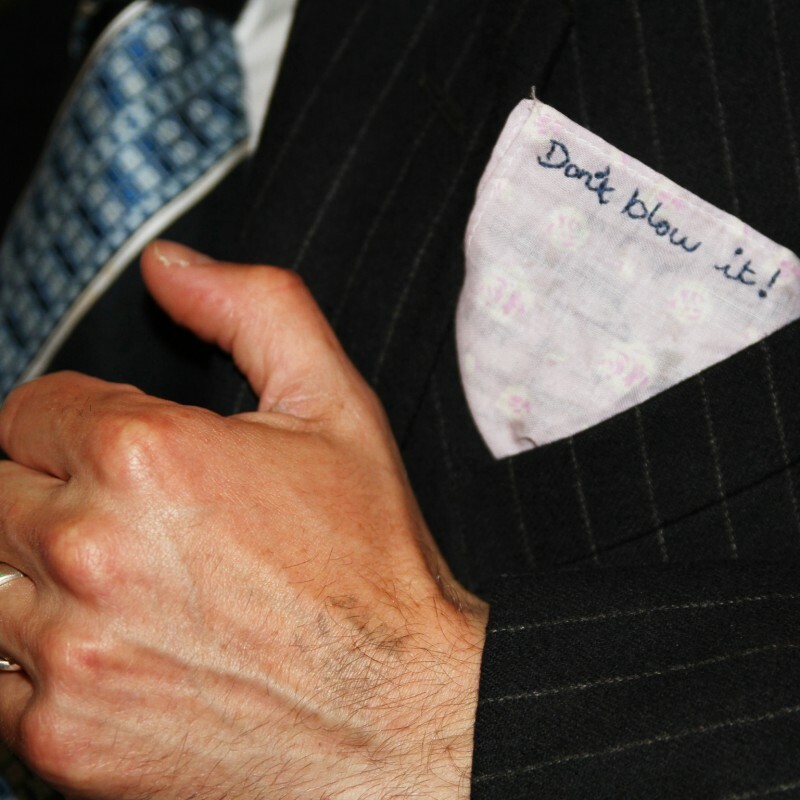 I am still working on my hanky and will be requesting a meeting with my MP once it is completed. I am not rushing this project like I might once have done. 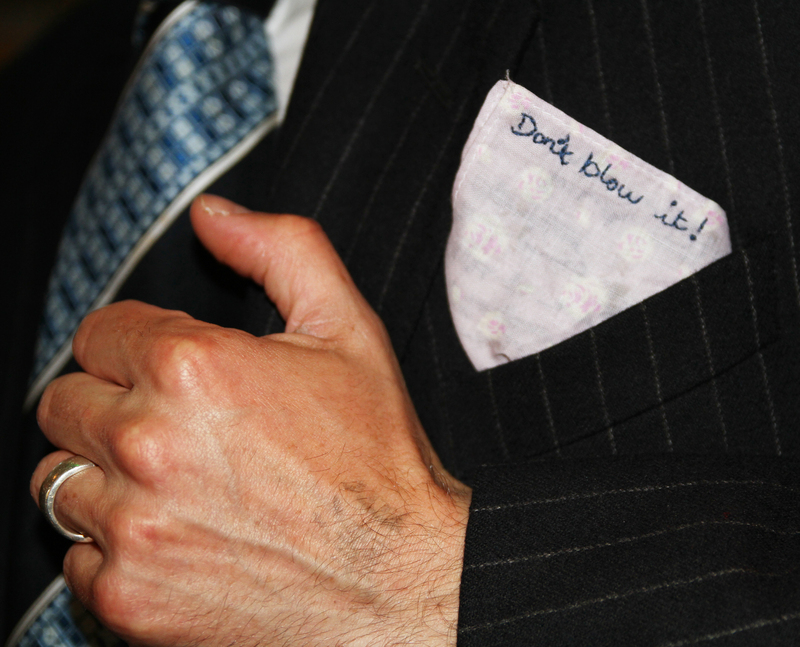 I am thinking about the message behind the hanky, what it signifies and how it might make a difference. I hope that my MP will take notice for a start and not dismiss me. I would like it to be the start of a continuing dialogue between us where I can got o him with my concerns and know that he will listen and take on board what I am saying. In the area I live in there are currently several inconsistencies regarding access to healthcare and treatment for disabled people and I would like to try and bring these issues to his attention. For example, I have access to an excellent care package from my council. It allows me to live myself as close as possible to how I would live if I wasn’t a wheelchair user. If I lived just a few miles away over in the next local authority, I would not have access to the same care plan. Without my care package I couldn’t parent the way I wish to, I couldn’t work as a self employed artist without the support it gives me and my family and I wouldn’t be able to live my life the way I choose. All because I live in the wrong area. What were you thinking about while you were stitching? While at the MS event I was obviously thinking lots about MS and how my own life is affected by it. Now I am back home and working on my hanky I am thinking about all the other people that might benefit from the little piece of craftivism I am creating. Not just people with MS, but any disabled or vulnerable person. It is important to me to distinguish between disabled and vulnerable, not all disabled people are vulnerable too. The are times when I do feel vulnerable as a disabled person, as a woman, as a mother, but it does not define me and I don’t think my feelings of vulnerability are any greater than they would be as a woman without a disability. We are all vulnerable in different ways and it is important to me to distinguish this from my disability. I’m also thinking about the people I have already met through volunteer work with other disabled people and how I might be able to tackle the problems faced by disabled people in the first instance, rather than be reactionary once the problem already exists, particularly in my local area. How do you think that craftivism can change the world? I believe that most worldwide movements start with something small. It just takes one person to stop and say: ‘Hey, that’s not right…’ and if they go about it in the right way others will slowly start to listen and perhaps join in. So I guess craftivism is a win win situation for me. I love crafting and I can now use it to send out a message about any subject I feel strongly about. The MSLive session helped me find an outlet for my feelings regarding unfair treatment of disabled people. Being positive and almost introverted, it allows me to act on these frustrations without making myself ill through exhaustion and physical effort. I am 36 years old. I live in North Lincolnshire with my family. I’m a home educating, wheelchair rolling, eco-friendly, hand crafting Mummy. I own Pink Giraffe, Pink Giraffe Eco and Home-Ed Hoodies as well as running an eco friendly cleaning company with my husband. This has been a great read for me and I am sure many others will love it as well, Thanks for your efforts here.